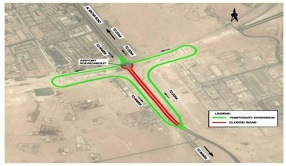 As part of the wider Expressway Programme in Qatar, CCC was commissioned to construct the F-ring Road (Package 12) which constitutes 8.2km of Expressway including two major interchanges. ACE was appointed as Design Sub-Consultant by CCC and tasked with completing all design work required by the contract. • Detailed Design of over 4km of Temporary Roads tying into existing and proposed conditions. • Approvals for all Road Geometry. • Final Approvals from Traffic Department, Project Consultants and Ashghal. In addition to the works at Interchange 25, ACE also provided temporary traffic management plans for the diversions around Interchange 26 (road closures) and bespoke TTM plans for sporting events that occurred during the construction period. Temporary Surface Water Drainage - ACE produced various options for managing the SWD while the permanent outfall is constructed. These ranged from soak-a-way solutions to positive collection and pumping stations to assigned Emergency Flooding Areas. ACE produced cost analysis for the options allowing the Contractor to choose the most appropriate. With the latter option being chosen, ACE prepared detailed designs for a temporary drainage system including three major pumping stations and three EFAs. Permanent Fire Fighting Provisions - ACE were required to design and secure all necessary approvals for the permanent fire fighting provisions for the two underpasses for Interchange 25 and 26. The underpasses were designed and reviewed using NFPA (501) which classified both underpasses as Category A tunnels.